Discussion regarding the Antumbra ROT8 module. I am almost done building a Rot8 1.1 PCB and just noticed that C2 is not in the BOM or build doc. Anyone know what's supposed to go at C2? Just ordered my mouser BOM for V1.1. This will be my first ‘proper’ module build. Couldn’t be starting with a cooler looking module. Just finished building one yesterday. I haven't tested it with sound yet, but everything seems to work fine as the switches and leds are working well together, regarding the manual. Firstable I would like to thank David for his listening and supporting. It's an easy build, no small parts or tricky stuff, just pay attention to the orientation of IC'S, leds etc... It's not a beginner build, but if you have quite a few smd builts behind you it's ok. I had trouble concerning the flashing, but it's not because of the module but because of my laptop. I use virtual box on mac and it took me 2 days to see that Windows wasn't seeing the programer. Anyway, after I fixed it it was easy. I will play with it now! It's a really good looking sequencer, the panel is nice, good quality, and it's really cheap to build! looking for cheaper programmers I found these two on amazon with good reviews. Any reason why they won't work? Hey guys, I appear to have successfully built my Rot8, but am struggling with the flashing (not something i've done before). I'm using a Twarm.com AVR ISP MkII, and trying to run it through AVRDUDESS. It doesn't seem to be picking up the MCU (which i'm guessing is the controller). Please help! I have built a ROT8 today and managed to get it flashed correctly. However, all seems to work except the step buttons. They do not seem to respond at all on any menu page. The only mistake that I know of was forgetting to solder the left side of U1 before powering up (oops) which I have since soldered. Turns out these pins corresponded to all of the outputs (Qa-Qh) as well as the chip's ground pin. Could this have damaged this shift register chip? Reflowed the Atmega Chip and the CD4021 and it works! Woo! Loving the module now, thanks Antumbra! Just built my second one of these, as I love the first! Finished the build over an hour ago, been pulling my hair out trying to get it to stop blinking and work properly. Messing with fuse codes, reflowing, oscilloscope probing etc. Finally it came to me - the last line of the build doc: "On the first run, you have to reset the module." The reset command - holding buttons A and C - is printed in the manual but not right there on the build doc! Ah well, still a great module! 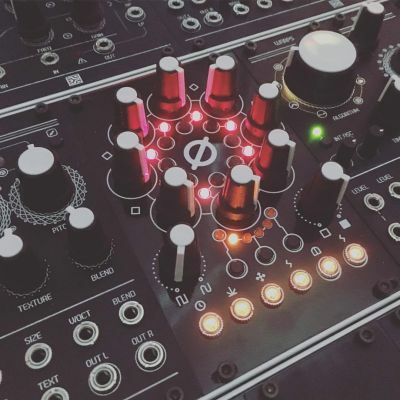 I've been trying to find a modular sequencer to replace my sq1 and this looks nice but can't find good videos about it. Would you say the Rot8 is a decent all around sequencer for a small system? I have just finished to build mine. It's a very cool sequencer, well thought, compact and efficient. 1 - Finished the build. 2 - Flash the module. 3 - But not :-( the seq was not able to follow the lfo in the clock in. He work, but not fine. 5 - Ok, there is a quartz, the CPU clock. 7 - David they me, "flash the module carrefully, and be focuses on the fuses"